Corby Town may still be hanging on to the hope that they can find a way into the Evo-Stik League South play-offs this season. But unless there is a big improvement in the busy weeks ahead, they can, quite simply, forget it. This 2-0 defeat to struggling Gresley FC at a bitterly cold Steel Park was as bad as it gets as the Steelmen went down with a whimper. There was very little to warm the souls who ventured out in the sub-zero temperatures as Corby rarely troubled their battling visitors, who did what they had to do. Gresley defended resolutely, they took their chances when they came about and, in truth, they looked like a team who really, really wanted to win. It all adds up to leave Steelmen caretaker-manager Steve Kinniburgh with something of a conundrum for the remainder of the season. The last thing he will want is for the campaign to end with a whimper but there may also already be an eye on the next season because, on this evidence, Corby won’t be troubling the top six in the final 10 games. They actually created the first big chance of the afternoon in this one with Jordon Crawford, one of a few who really looked like he wanted it, breaking away and seeing his shot tipped over the crossbar by Callum Hawkins. But it was Gresley who broke the deadlock when Reece Morris, a real livewire on the right, fed the ball into Danny Quinn and he turned away from Peter Dearle before finding the bottom corner with a good low strike back across goal. It could have been worse before the break when Matt Melbourne’s curling shot cannoned off the inside of the post and that was enough to convince Kinniburgh to leave the dugout early and head for the tunnel before the half-time whistle had been blown. With some choice words no doubt ringing in their ears, the Steelmen were brighter after the break. Ash Robinson went close to levelling when his shot struck the top of the crossbar while Hawkins parried away a Steven Leslie strike before Phil Trainer flicked a header just over. 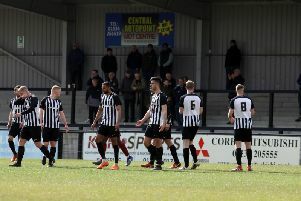 But, as they struggled to find a way through, Corby were hit with a sucker-punch with 20 minutes to go when Quinn got away down the right and fired the ball over for Oliver Bassett who beat Sam Wilson with a crisp, first-time finish. From there, the Steelmen huffed and puffed but it was the visitors who went closest to adding to their tally with Bassett firing over from a good position while Dearle was well-placed to clear a Melbourne effort off the line. The job was well and truly done for Gresley though as they celebrated a crucial three points in their quest for survival. The Steelmen, on the other hand, trudged off knowing that any chance of threatening the top six might just have been blown. Steelmen: Wilson; Anton, Dearle, Malone, Warburton; Kennedy, Robinson (sub Aridegbe, 87 mins); Bettles (sub Tuksar, 64 mins), Leslie, Crawford; Trainer. Subs not used: Smith, McBride. Gresley FC: Hawkins; Roome, Jarvis, Barrett, Branch; Morris (sub Mwanyongo, 67 mins), Phillips (sub Morris-Clarke, 59 mins), Manship, Bassett; Quinn (sub Mead, 86 mins), Melbourne. Subs not used: Egginton. Goals: Quinn (34 mins, 0-1), Bassett (70 mins, 0-2). Bookings: Trainer, Branch (both fouls).